A fitting denoument to the Guerrero saga. And go easy on Dave Chalk. His 1975 Topps card (w/ the Angels) adorns my front door in eternal tribute to the NCAA basketball-forecasting prowess of the legendary Matt Pavoni. cue: ‘Drifter’s Escape’ by Bob Dylan. One of his great elegies. 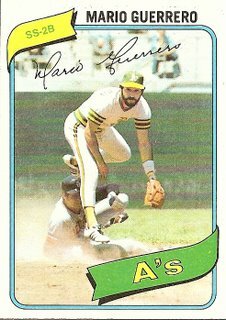 I do feel bad about implicating the ever-steady Dave “Pavoni” Chalk in the portrait of the has-been and never-were A’s, but he really was winding down his career by the time he and Mario Guerrero were fighting for playing time behind the immortal Rob Picciolo.